Proven technology, sleek and elegant design – that is how the Compact hand control is made. 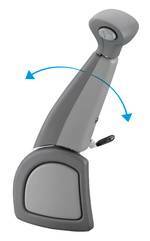 The function is simple: to accelerate, pull the ergonomically shaped handle backwards, a slight push in the forward direction operates the brake. The mechanical brake lock can be easily engaged with the push of a button. The handle is shaped in such a way that the hand can rest on it while driving. This means relaxed and effortless driving, even on long distances. The hand control can be folded out of the way when not in use.